Mediaraptor allows you to record millions of MP3s from Web radios and music videos online. No P2P file sharing networks is needed. Simply enter the artist, genre or song title and the Mediaraptor starts searching millions of files for tons of free MP3 music - complete with ID3 tags, cover art and even lyrics. No more annoying waiting - just make a few quick recordings with social radios and start listening. The Mediaraptor MusicFinder fulfills your musical wishes by scanning thousands of Web radio stations. 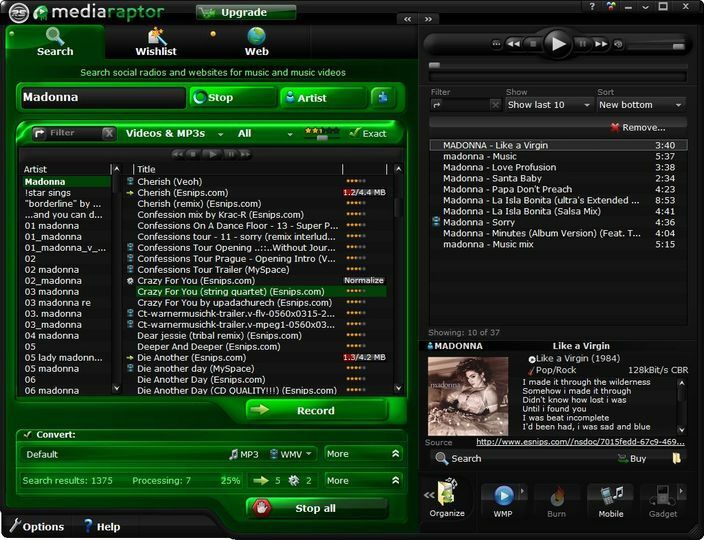 The Mediaraptor Web recorder automatically records all of the music and videos you have previously enjoyed at various social radio and video portals. Create an MP3 or music video collection automatically from social Web radios using the wish list. With the profile editor, you can customize quality specifications and other parameters for playback with cell phones, iPods, or MP4 players. Convenient functions: download manager, auto tagger, mobile synchronization, CD burner, and a generator for cell phone ring tones. would be great if it was free.Have to buy a license key to get full effect from program.